The Chinese pine (Pinus tabuliformis) is an indigenous conifer species in northern China but is relatively underdeveloped as a genomic resource; thus, limiting gene discovery and breeding. Large-scale transcriptome data were obtained using a next-generation sequencing platform to compensate for the lack of P. tabuliformis genomic information. The increasing amount of transcriptome data on Pinus provides an excellent resource for multi-gene phylogenetic analysis and studies on how conserved genes and functions are maintained in the face of species divergence. The first P. tabuliformis transcriptome from a normalised cDNA library of multiple tissues and individuals was sequenced in a full 454 GS-FLX run, producing 911,302 sequencing reads. The high quality overlapping expressed sequence tags (ESTs) were assembled into 46,584 putative transcripts, and more than 700 SSRs and 92,000 SNPs/InDels were characterised. Comparative analysis of the transcriptome of six conifer species yielded 191 orthologues, from which we inferred a phylogenetic tree, evolutionary patterns and calculated rates of gene diversion. We also identified 938 fast evolving sequences that may be useful for identifying genes that perhaps evolved in response to positive selection and might be responsible for speciation in the Pinus lineage. A large collection of high-quality ESTs was obtained, de novo assembled and characterised, which represents a dramatic expansion of the current transcript catalogues of P. tabuliformis and which will gradually be applied in breeding programs of P. tabuliformis. Furthermore, these data will facilitate future studies of the comparative genomics of P. tabuliformis and other related species. Conifers are widely distributed globally as the largest and most diverse group of gymnosperms  that evolved independently from angiosperms >300 million years ago . Modern conifers are divided into eight families including 68 genera and 630 species, which form an integral part of the economy in many parts of the world . Chinese pine (Pinus tabuliformis Carr.) is a widespread indigenous conifer species and an economically and ecologically important hard pine in northern China [4, 5]. Because of its irreplaceable economic development and environmental protection status, a genetic improvement program for P. tabuliformis was initiated in the 1970s, and considerable progress has been made in many basic physiological aspects . The study of natural genetic variation in P. tabuliformis has traditionally been investigated using a common garden approach, whereas the pace of development of genomic resources has been slow, as only 288 P. tabuliformis entries are included in the NCBI database. Information regarding the genetic control of many important traits and fine-scale genetic variations is extremely limited, and more is needed given the renewed emphasis to accelerate the pace of P. tabuliformis breeding and shorten the breeding cycle. Despite the economic and ecological importance of the genus Pinus, the progress of entire genome sequencing and associated marker development has been limited [6, 7]. Huge genomes with highly heterozygous and large amounts of repetitive DNA elements are the major obstacles towards sequencing the genomes of all Pinus spp. [8, 9]. The genome sizes of conifers are larger than those of most other plant species. The genome in all extant members of the genus Pinus is 18,000–40,000 Mbp . In contrast, several representative genera of angiosperm trees have genome sizes of 540–2,000 Mb . Therefore, researchers have focused on the transcribed part of the genome using dedicated technologies [6, 7]. Transcriptome analysis and construction of large-scale expressed sequence tag (EST) collections in pines are a promising means of providing genomic resources [2, 9, 11], as this technique produces expressed sequence portions of chromosomes at a fraction of the cost of sequencing the complete genome . It also facilitates the analysis of the transcribed part of the genome, which is not easy to predict from the entire genome . Next-generation sequencing is a viable and favourable alternative to Sanger sequencing and provides researchers with a relatively rapid and affordable option for developing genomic resources in non-model organisms [14–16]. The Roche 454 massively parallel pyrosequencing platform, GS FLX Titanium, can generate one million reads with an average read length of 400 bases at 99.5% accuracy per run [17, 18]. In addition to the discovery of new genes and investigations of gene expression, thousands of simple sequence repeats (SSRs), single nucleotide polymorphisms (SNPs) and insertions and deletions (Indels) have been detected in transcriptome data [6, 19]. It is possible to use these genome-wide and abundant markers to develop very dense genetic maps that can be applied to conduct marker-assisted selection breeding programs . Moreover, the increasing availability of transcriptome data represents an excellent resource for comparative genomic analysis. Although there has been much work on the chloroplast DNA sequences (cpDNA) and mitochondria DNA sequences (mtDNA), based on phylogenetic analysis of Pinus[21–23], less emphasis has been placed on multi-gene phylogenetic analysis and on determination of how conserved genes and functions are maintained despite species divergence. In the current study, we used the Roche 454 GS-FLX Titanium pyrosequencing platform to obtain a comprehensive transcriptome of P. tabuliformis from normalised cDNA libraries of adult trees (xylem, phloem, vascular cambium, needles, cones and strobili). As a result, thousands of molecular markers were characterised. Evolutionary studies based on these data and other shared transcriptome data of five pine species and one spruce species were conducted. These data provide compelling new insights into the transcriptome of P. tabuliformis and evolution of genes in the Pinus phylogeny. Prior to sequencing, the cDNA samples obtained from multiple tissues and individuals were normalised to increase the sequencing efficiency of rare transcripts. Subsequently, 911,302 raw reads with an average length of 382 bp were generated from a full 454 GS-FLX run. After a trimming process removed adaptors, primer sequences, poly-A tails as well as short, long and low quality sequences, 822,891 (84.7%) high-quality reads were obtained with an average length of 358 bp covering a total of 21,076,176 bases (Table 1, Figure 1a). Cleaned and qualified reads were de novo assembled using CAP3 and Newbler. This process produced a set of 31,623 isotigs and 17,853 remaining as singletons. More than half of the total assembly length of isotigs was > 700 bp (N50 = 744) (Table 1, Figure 1b). Overview of Pinus tabuliformis transcriptome sequencing and assembly. (a) Frequency distribution of 454 sequencing read lengths after filtering and trimming adapters. (b) Length distributions for isotigs and singlets following the de novo assembly process. The abscissa has been truncated at 2 kb. The longest isotig was 3,537 base pairs. An isotig is meant to be analogous to an individual transcript. 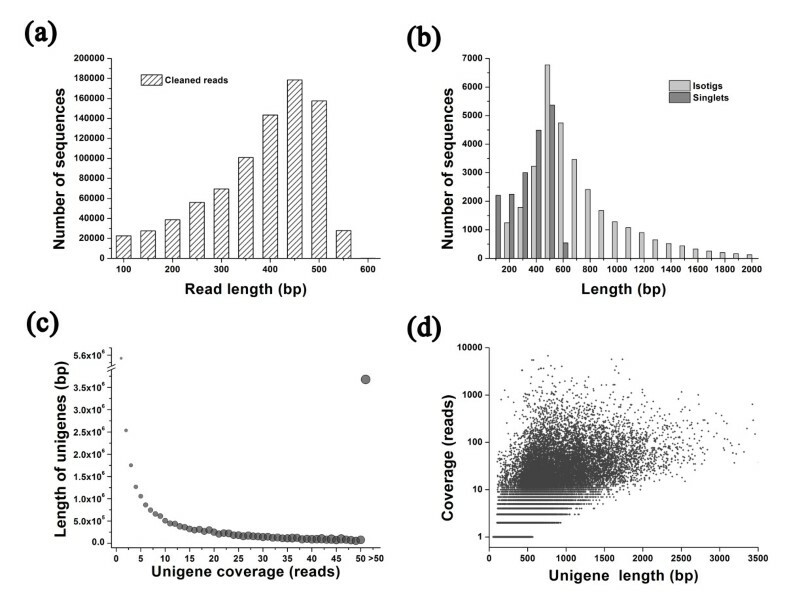 (c) The average read-depth coverage for assembled unigenes. The y-axis label refers to the total length of all unigenes with the same read-depth coverage. Coverage values from 50 to 6,765 have been binned together. The size of the bubble is proportional to the average unigene length at the corresponding read-depth coverage. (d) A density scatter-plot showing the relationship between unigene length and coverage. The unigene coverage distribution revealed that most unigenes had a read-depth coverage <20-fold (Figure 1c, d). The steep decline in read-depth coverage suggests that cDNA normalisation was effective, which is typical for a normalised library . Isotig lengths were related to the number of sequences assembled into each isotig. The average unigene length exhibited a gradual increase with increasing read depth (Figure 1c, d). The unigenes were annotated with gene names and Gene Ontology (GO) terms based on sequence comparisons between P. tabuliformis transcripts and the NCBI non-redundant protein database. We examined the taxonomic distribution of BLASTx best hits. As a result 99.3% (21,041) of the unigenes had a best hit to Pinaceae, but 95% were unknown functional proteins. Of the 3,151 genes with specific functional annotation, 18.9% were within Pinus and 9.7% were within Picea (Figure 2). The even distribution of assignments of proteins to more specialised GO terms further indicates that the P. tabuliformis 454 sequences represent proteins from a diverse range of functional classes (Figure 3). Summary and taxonomic source of BLASTx matches to unigenes. Number of unique best BLASTx matches of unigenes grouped by genus. 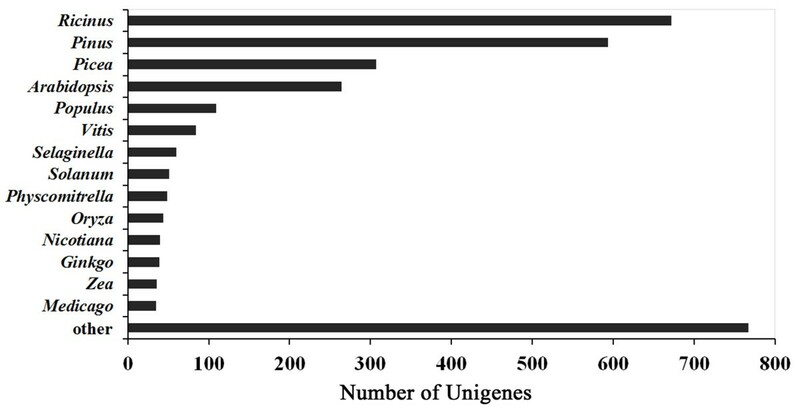 The best matches of the unigenes to Pinaceae sequences accounted for 28.6% of the total. Gene Ontology (GO) distributions for the Pinus tabuliformis transcriptome. Main functional categories in the biological process, cellular component and molecular functions found in the transcriptome relevant to plant physiology. The abscissa indicates the number of unigenes. Bars represent the numbers of assignments of Pinus tabuliformis proteins with BLASTx matches to each GO term. One unigene may be matched to multiple GO terms. 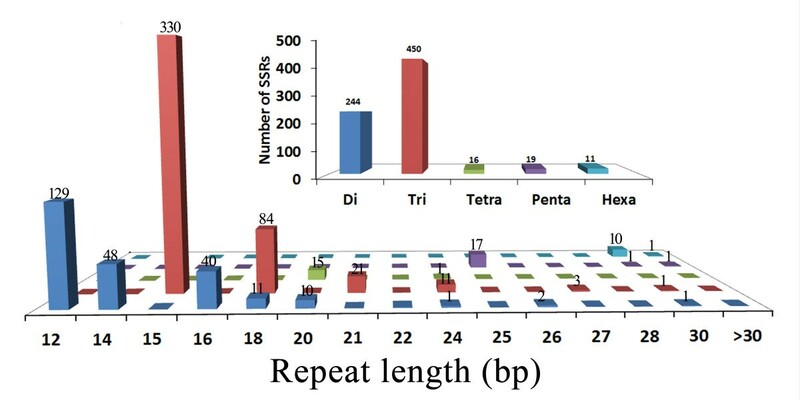 Di- to hexa-nucleotide SSRs with a minimum repeat unit size of five (for tri- to hexa-nucleotide) or six (for di-nucleotide) were identified based on the analysis of assembled isotig templates. A total of 724 distinct loci were identified, and the incidences of different repeat types were determined. The tri-nucleotide repeats were most abundant (62.2%), followed by di-nucleotides (33.7%), among the various classes of SSRs (Figure 4). Distribution of simple sequence repeats (SSRs) in Pinus tabuliformis expressed sequence tags (ESTs). Di-, tri-, tetra-, penta- and hexa-nucleotide repeats were analysed and their frequencies plotted as a function of the repeat number. The upper right histogram shows the distribution of the total number of SSRs in different classes. More than 92,000 SNPs/Indels were identified (61,454 SNPs and 31,030 Indels) from the P. tabuliformis ESTs. The number of SNPs/Indels detected per transcript was highly variable; however, approximately 40% of the transcripts contained only one or two SNPs/Indels (Figure 5a). Among all SNPs, transitions (69.5%) were more frequent than transversions (30.5%) (Figure 5b). A and T were the most frequent insertion (76.7%) and deletion (79.5%) types of InDels (Figure 5c). The distribution of alternate allele frequencies in all contigs containing InDels was less frequent in total transcripts, but the SNPs were distributed evenly (Figure 5d). 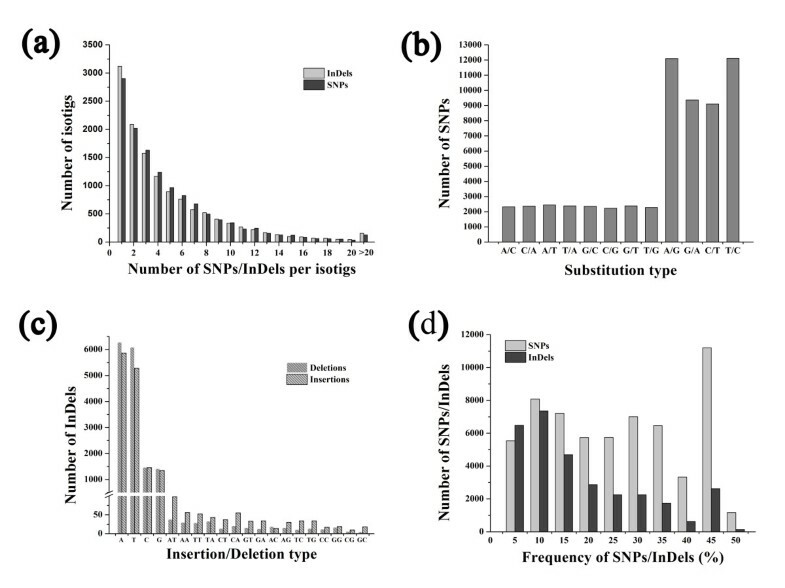 Quality of single nucleotide polymorphisms (SNPs) and insertion/deletions (InDels) in Pinus tabuliformis (isotigs. a) Numbers of SNPs and InDels detected per transcript. (b) Frequencies of different substitution types of SNPs. (c) Frequencies of different insertion/deletion types of InDels. (d) Distributions of SNPs and InDels in total transcripts. The x-axis represents the percentage of one SNP/InDel allele in the population. Large-scale transcriptome characterisations have been carried out for Pinus taeda, Pinus contorta, Pinus sylvestris and Pinus pinaster. 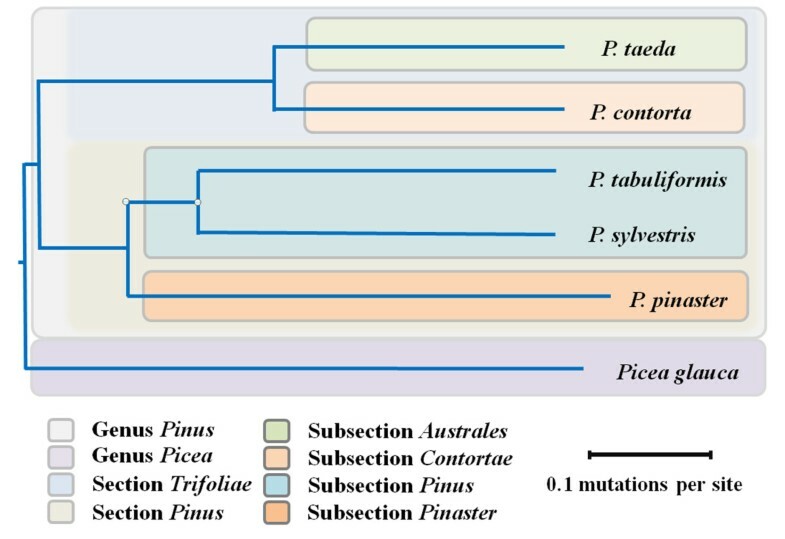 The shared transcriptomes of Pinus in the PlantGDB and NCBI databases are valuable sources of information for multi-gene comparative and phylogenetic analyses . A comparative analysis of the transcriptomes of P. tabuliformis, P. contorta, P. pinaster, P. sylvestris, P. taeda and Picea glauca yielded 191 putatively orthologous sets of ESTs (Additional file 1). The orthologues were annotated with GO terms, and 54 orthologues were involved in biological processes, 33 orthologues were involved in cellular components, 54 orthologues were involved in molecular functions and the other 50 orthologues had unknown biological functions (Figure 6). Functional annotation and divergence between homologs of five pine and one spruce species. The heat map is based on the 191 putatively orthologous transcripts of six species. The homologs were annotated with Gene Ontology (GO) terms. Colours indicate similarity from yellow (highly similar) to red (weakly similar). The “2× average” is an overall measure of how similar the different species are. Phylogenetic analyses of Pinus species and Picea glauca as an out-group were conducted from 191 clusters of orthologous transcripts, using non-synonymous substitution rates as a distance metric. The results in Figure 7 show good agreement with classical taxonomy. Similar concordance was observed in the cpDNA and mtDNA-based reconstructions of the Pinus phylogeny [21, 22]. Phylogram of the five pine and one spruce species. Phylogram derived using pairwise non-synonymous substitution rates of orthologous transcripts as a distance metric (not from multiple sequence alignments) and the neighbour-joining method . Branch lengths indicate the non-synonymous substitution rates between different species. We estimated the level of synonymous substitutions for 191 pairs of orthologues identified among the six species and 6,053 pairs of orthologues identified between P. tabuliformis with P. taeda as a control to assess the relative age of these species separations. The Ks peaks (Picea glauca = 0.1, P. taeda and P. contort = 0.03, P. pinaster and P. sylvestris < 0.01) indicate the speciation time between P. tabuliformis and these species (Figure 8). Considering a clock-like synonymous mutation rate of 0.68 × 10-9 substitutions/site/year in conifer genes based on pairwise comparisons of 3,723 spruce (Picea sitchensis) and pine (P. taeda) orthologues , the speciation between spruce and pine was estimated to have occurred ~147 million years ago (mya) and between section Trofoliae and section Pinus ~44 mya ago. Distribution of Ks values of orthologous pairs for identifying speciation events. Data were grouped into bins of 0.02 Ks units for graphing. The upper right graph shows the Ks distribution of the 6,053 pairs of orthologues identified between P. tabuliformis and P. taeda. Given the rate of substitutions/synonymous site per year, the peaks (Picea glauca = 0.1, P. taeda and P. contort = 0.03, P. pinaster and P. sylvestris < 0.01) indicate the speciation time between P. tabuliformis and these species. We estimated evolutionary measures at 6,053 orthologues of P. tabuliformis and P. taeda. The number of pairwise synonymous (Ks) and non-synonymous (Ka) substitutions per site was inferred (Figure 9). 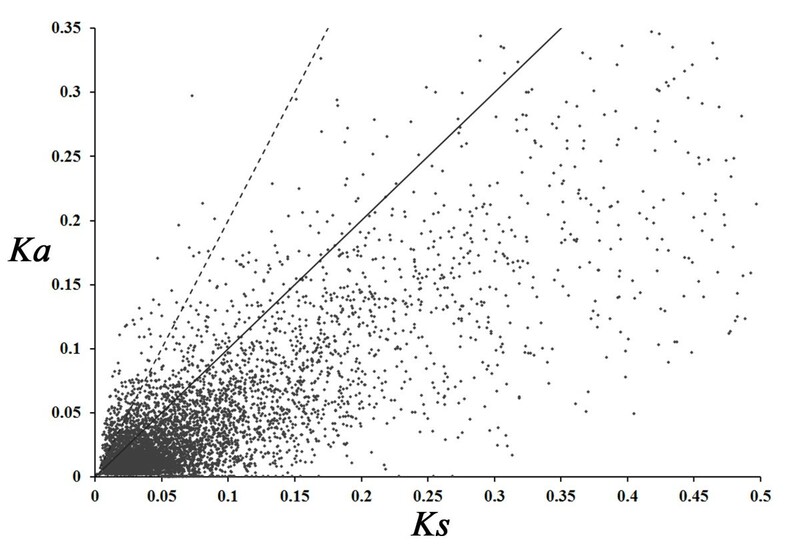 The results show that a majority of sequence pairs (85%) had a Ka/Ks ratio < 1, suggesting that these evolved under purifying selection without altering the encoded amino acid sequence during the speciation period. We also identified 938 fast evolving sequences with a Ka/Ks ratio > 1 and 207 sequences with Ka/Ks ratios > 2 (Additional file 2). These sequences are related to several biological processes, cellular components and molecular functions. Therefore, these ESTs may be useful for identifying genes that may have evolved in response to positive selection and might be responsible for speciation in the Pinus lineage. 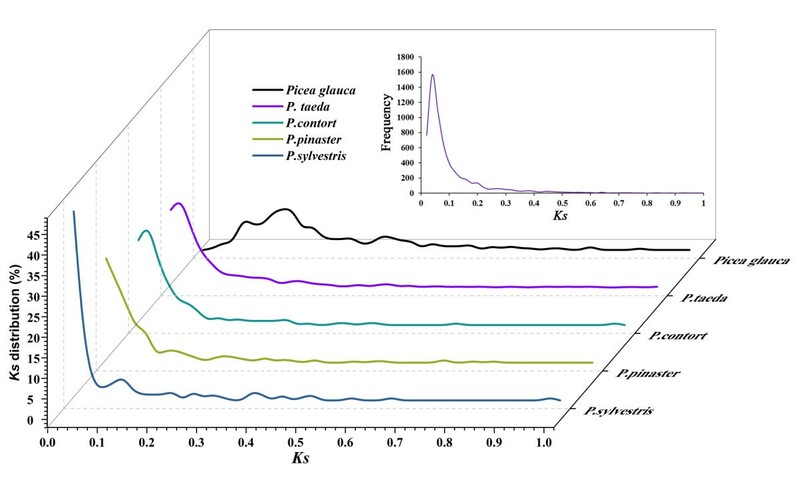 Ka / Ks distribution among 6053 homolog pairs of Pinus tabuliformis and P. taeda . The mean Ka/Ks value was 0.63. The solid line shows the threshold of Ka/Ks = 1, whereas the dashed line marks the more conservative threshold of Ka/Ks = 2. Overall 938 orthologous sequences fell above the light solid line and 207 sequences fell above the dashed line. A large number of ESTs for pines have been sequenced to date (Table 2). Due to the economic value of wood and pulp products, the initial EST projects on pine focused primarily on the transcriptional regulation of wood formation . Large numbers of ESTs have been sequenced and analysed in pine to discover wood formation and wood quality trait related genes [30–33]. Sequencing novel genes expressed during wood formation represents a powerful approach to understanding wood formation at the molecular level and identifying the mechanisms that control this important differentiation pathway. A total of 260 differentially expressed sequences have been identified across six cDNA libraries from the xylem of P. taeda. A large number of represented gene sequences from xylem-forming tissues of loblolly pine have been compared with the inferred gene sequences of Arabidopsis thaliana. In addition, 42 EST resembled gene products important for drought tolerance have been identified from root tissue libraries . To study similarities between angiosperm and gymnosperm embryo development, 83 embryogenesis-related genes were identified from embryo cDNA libraries . Most genomic studies of pines have focused on loblolly pine, while additional sequencing efforts are needed to develop genomic resources for other pines. Transcriptome sequencing in Pinus spp. Despite the fact that a large number of pine ESTs have been obtained from cDNA libraries based on traditional sequencing technology, the methods used were inefficient. Four P. taeda cDNA libraries were sequenced and yielded a total of 142,533 ESTs (Table 2); however, only one normalised cDNA library yielded 822,891 ESTs in P. tabuliformis (Table 1). Although traditional sequencing yields longer EST sequences, it has little advantage compared to new assembly technology based on the large-scale ESTs. Additionally, most previous studies used a cDNA library of one tissue (Table 2), whereas we used a normalised cDNA library comprising multiple tissues and individuals. These large-scale ESTs will provide more comprehensive pine transcriptome information and facilitate the assembly of Pinus spp. ESTs in the future. Next-generation sequencing technology yields a large number of sequences at considerably lower costs compared to traditional sequencing methods, and, therefore, provides a valuable starting point to expedite analysis of less-studied species [18, 36, 37]. Normalised cDNA libraries were used to sample large numbers of transcripts to maximise sequence diversity. Next-generation sequencing of normalised libraries is more efficient than that of non-normalised libraries, particularly for rare transcripts . The capacity to deliver large numbers of gene-based markers from transcriptome sequencing projects is a major advantage of next-generation sequencing technology [18, 20, 36]. Because of cost and throughput, conventional markers such as restriction fragment length polymorphism and random amplified polymorphic DNA are being replaced with SSRs and SNPs . The genome-wide and abundant EST-based SSRs and SNPs/Indels markers obtained by next-generation sequencing represent an effective approach to marker discovery in many plant species, as these markers facilitate generation of dense genetic maps and have the advantage of higher cross-species transferability [6, 39–41]. However, relevant studies in Pinus spp. are limited. In this study, 724 distinct EST-SSR loci and more than 92,000 SNPs/InDels were identified. It is possible to use these markers in a broad range of applications, including genetic mapping, genotype identification, marker-assisted selection breeding, and molecular tagging of genes. Among the EST-derived SSRs, tri-nucleotide repeat units were predominant. Considering the importance of maintaining reading frames to generating a polypeptide within a partially or fully active, it is no surprise that this observation is common for tri-nucleotide expansions (or their multiples) within translated regions [6, 42, 43]. As usual, comparisons of P. tabuliformis transcriptome SNPs show an excess of transitional over transversional substitutions. Similarly, A and T were the most frequent insertion and deletion types of Indels. Part of this bias is due to the relatively high rate of mutation of methylated cytosines to thymines [44, 45]. Comparative phylogenetic analysis at the genome level dramatically improves the precision and sensitivity of evolutionary inference . However, comparative genomics in plants has been limited by the considerable phylogenetic distances between sequenced organisms . Transcriptome sequencing using massively parallel sequencing technologies provides an attractive approach to obtaining large-scale sequence data for non-model organisms necessary for comparative genomic analysis [24, 48]. Phylogenetic utility of transcriptome sequence data yields well-resolved and highly supported tree topologies for many groups of animals [49–51]; however, few such studies have been conducted with plant taxa . 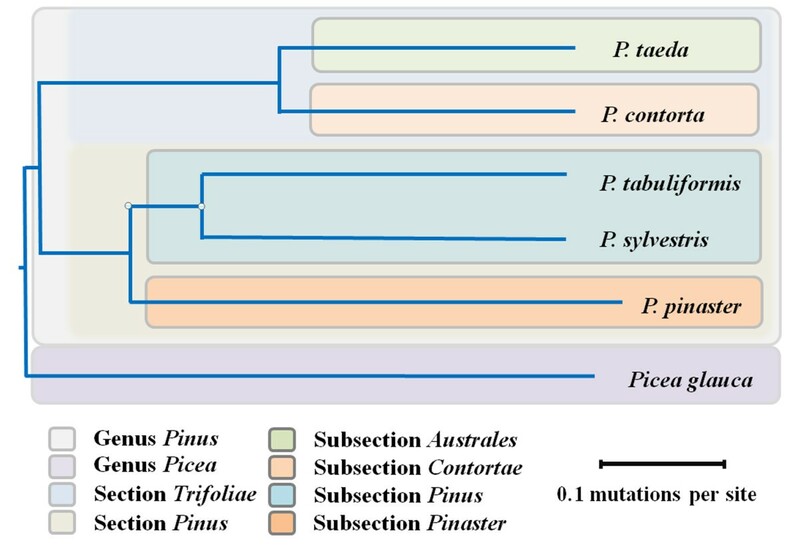 Phylogenetic analysis of the genus Pinus has been limited mostly to plastid genome (cpDNA and mtDNA) sequences [21–23]. The results of this study are consistent with previous data on plastid genome phylogeny [21, 22], but transcriptome analyses, producing more robust results, are presented for the first time. Given that this study was not limited to particular genes or motifs, the results presented here are more representative of Pinus evolution than previous studies. Understanding the factors that affect the evolutionary patterns and rates of genes is central in many research fields . For the past 30 years, it was thought that the rate of gene evolution was determined by protein function . Studies on yeast and bacteria indicate that the expression level of a protein affects the evolution rate more than its functional category, at least in unicellular species [54, 55]. In this study, we have shown that sequence polymorphisms of the 191 putatively orthologous sets of ESTs of six Pinus species are widespread using GO terms. This suggests that selection of protein function does not contribute to the variation in the rates of gene evolution. However, most of the important factors are correlated with each other. More systematic analyses of genomic data are required to further demonstrate the effect of a range of factors on the evolutionary patterns and rates of genes. This study is the first comprehensive sequencing effort and analysis of gene function in the transcriptome of P. tabuliformis and represents the most extensive expressed sequence resource available for P. tabuliformis to date. GO and KEGG analyses were carried out, and all unigenes were classified into functional categories so as to understand their functions and regulation pathways. An enormous number of SSR and SNP/Indel loci were detected. These data can be used to develop oligonucleotide microarrays or serve as a reference transcriptome for future RNA-seq experiments in large-scale gene expression assays. These data will accelerate our understanding of genetic variation in populations and the genetic control of important traits in P. tabuliformis. Additionally, the generation of such large-scale sequence data is a potentially invaluable scientific resource for mapping, marker-assisted breeding and conservation-genetic-oriented studies in P. tabuliformis and comparative evolutionary analysis of Pinus plants. P. tabuliformis tissues were collected from 4–20 individual trees selected at random (genetically distinct) in a primary clonal Chinese pine seed orchard located in Xingcheng City, Liaoning Province, China (40°44’N, 120°34’E, 100 m above sea level) . The sampling time and number of individuals of each tissue type are listed in Table 3. Developing xylem tissues were scraped from the exposed xylem surface at breast height (1.5 m) after removing the bark from the sampling area. Samples were immediately placed in liquid nitrogen in the field until storage at −80°C. Total RNA isolation from samples of all selected plant tissues, and cDNA library construction and normalisation were performed as described previously . The pooled library was sequenced in a full 454 plate run on the GS-FLX Titanium platform (Roche, Indianapolis, IN, USA). All generated ESTs were pre-screened to remove adaptor-ligated regions and contaminants by Seqclean and to trim low-quality regions by LUCY2 . Because no reference P. tabuliformis genome exists, cleaned and qualified reads were assembled de novo in Newbler 2.5.3, which performs best for restoring full-length transcripts [13, 58]. The assembled isotig and singleton sequences were combined and clustered with CD-HIT (version 4.0) [59, 60]. The sequences with similarity >95% were divided into one class, and the longest sequence of each class was treated as a unigene during later processing. Descriptive annotations and GO classifications were performed as described previously . We simultaneously instituted a search for putative unigenes against the NCBI protein database using a BLASTx and annotated each sequence with GO terms using Blast2GO. Assembled isotigs with coverage of at least four reads were screened for SSRs, SNPs and InDels using Misa and ssahaSNP software, respectively . Similar criteria for screening high-quality SNPs have been used in previous studies [20, 62]. Only perfect repeats of two to six nucleotide repeats were identified. The minimum repeat-unit size for di-nucleotides was set at six and at five for tri- to hexa-nucleotide repeats. The shared transcriptome data of five conifer species in the PlantGDB and NCBI databases were downloaded. The numbers of unigenes for each species were as follows: Picea glauca (48,619), P. contorta (13,570), P. pinaster (15,648), P. sylvestris (73,609) and P. taeda (77,540). Along with 46,584 unigenes of P. tabuliformis, clustering was carried out among the transcribed sequences using UCLUST software . Aligned sequences (at least 100 bp) showing 90% identity were defined as pairs of putative orthologues among six species. The best-hit sequence of each cluster was then used in subsequent analyses. Orthologues of P. taeda and P. tabuliformis were searched using the same approach. Sequences of P. tabuliformis were annotated with GO terms using Blast2GO. Because unigenes are derived from EST sequences, have no annotated open reading frames and may contain frame shift sequencing errors, each member of a pair of sequences was searched using BLASTX against all plant protein sequences available in GenBank. The approach used was as described previously . PAML software was used to estimate the non-synonymous substitutions per non-synonymous site (Ka) and the synonymous substitutions per synonymous site (Ks) . Because the genus Pinus has a rich history of phylogenetic analysis and the relationships among the species in the genus are well understood [21–23], the precise topology is not critical for the purposes of this study. We chose to focus our analyses on the evolutionary pattern and rate of genes. The synonymous substitution and non-synonymous substitution between the orthologues of six conifer species were analysed as described previously. Phylograms were derived using pairwise substitution rates of orthologous transcripts as a distance metric with the neighbour-joining method . Picea glauca was used as an out-group to root trees. The raw 454 EST data obtained in this study were deposited in the NCBI Sequence Read Archive (SRA) under the accession number SRA 056887. This work was supported by grants from The Fundamental Research Funds for the Central Universities and the Special Fund for Scientific Forestry Research in the Public Interest (No.201104022). SHN participated in the sequence alignment and drafted the manuscript. ZXL and HWY participated in the samples preparation and 454 sequencing. XYC and YL participated in the design of the study and performed the statistical analysis. WL conceived of the study, and participated in its design and coordination and helped to draft the manuscript. All authors read and approved the final manuscript.